There was a really great energy at the U2 30th Anniversary Joshua Tree show in Washington DC last night. Bono seemed especially pumped. It was cooler than the previous shows I had been to in Miami, Louisville and Philadelphia. And the GA was not as crowded, even though it was sold out. I started my day work as this was a ‘hometown’ show for me – FedEx Field is only about a a 30 miles from me. I left work around 12:50 and was at FedEx Field by 1:30, but the paid lots did not open until 3pm. Other venues always say their lots don’t open until a certain, but they always open sooner. Not at FedEx Field. They coned off all the way around the Stadium, so there was no way to even get near it. I tried a few entrances, but no luck so I went to a nearby shopping center and hung out in the car for a while. Then Vicky and Romona met me and we tried again. First entrance closed, second entrance closed, then back to the first entrance and waited in line until 3pm. Ugh what an ordeal! 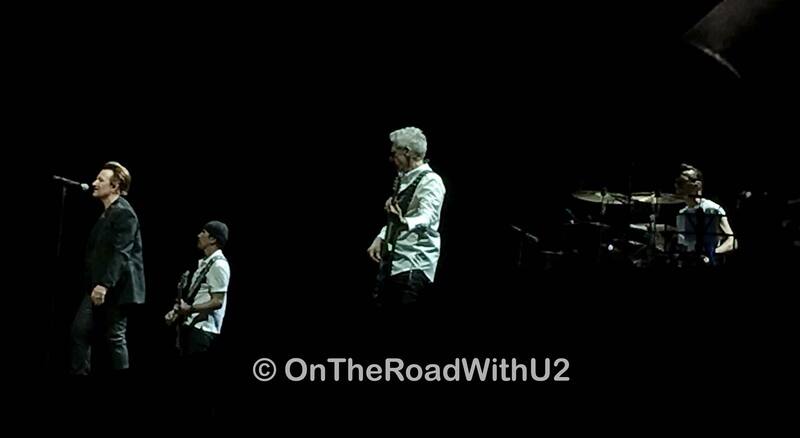 This is the closest U2 show to me, but it was the hardest and most frustrating to get to. After finally getting parked at 3:05, Vicky, Romona and I went over to wait for the band to arrive (the long walk from the parking lot because I parked next to the exit so furthest from the stadium). There I met my friend Mike from high school and finally met Gina who I have been chatting with online. And the other folks from the Dream Out Loud film joined us, along with about 20 other folks (maybe more but it wasn’t a big crowd). Around 3:45, Edge arrived. We found out later he did a VIP tour. The Lumineers arrived a bit later carrying their own gear. There were mounted police – the horses were beautiful. Tracy took a photo of all of us waiting, then made a call then told us Bono would not be stopping because he was running late. She made a point of saying ‘just Bono.’ So of course I asked about Larry, but she did not know. 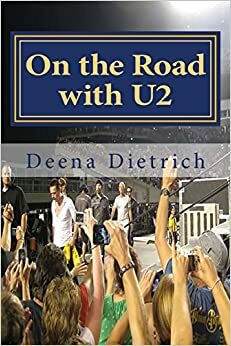 Then just before 6pm in a different then from where Edge drove in, Bono, Adam and Larry drove in (with about four other cars). No one stopped, but Bono rolled down his window and waved. Then Brian came out to talk with us. I asked if Larry would please come out in Jersey or Cleveland, and Brian said he would ask. We went inside after that. Walked all the way back over to the GA entrance, went to the bathroom, got a couple waters and headed down to the field. It was almost 6:30pm by the time we secured our spot on the front rail on the far right, which has become my usual place to stand. This time I was a little further to the right (about five people down from where I was in Philly and just a person or two down from where I was in Louisville). This was the latest I had every walked in (by about a half hour or so) and my friends with me are shorter than me so they needed to stand to my left otherwise they would not have been able to see past me. Sure I like being close to the band, but I don’t like it so much that I would stand in the GA line for two days to get it. Maybe if I was only going to one show, but I am going to 10 shows this leg (and two more in the Fall). I have three RedZone shows, so they are my shows to be on the rail at the tree stage. Walking in around 6pm I could be about four or five people back from the tree stage, but I don’t like being in the middle of the crowd like that. Besides this front rail spot far to the right is great. I am tall enough to see the tree stage and fairly close to the main stage and Bono, Adam and Edge all come over at least once during the show. Plus it’s very relaxing and I can lean on a rail and have no one in front of me. The Lumineers actually took the stage on top at 7:02 pm and played until 7:52. I still do not like them at all, especially the “oh my my oh hey hey” song – although most of their songs have that in it. And their last song about ‘hold your head up’ is almost six minutes long! Their only saving grace for me is Hot Guy. We call him Hot Guy because we don’t know his name, but he plays the drums and the guitar and the piano and is very good looking hence the name Hot Guy! At 8pm, the GA was not that crowded. Yes in the center of course it was but behind us it really wasn’t. I had space to move back and to the right if I wanted to where in Philly I was trapped until the show was over. It was also not as hot as it was in Philly (or Louisville for that matter). The humidity was low and there was a nice breeze. It was a very pleasant night in DC. U2 took the stage at 8:57pm when Larry strutted out in his black tee and black pants. Edge must have been cold because he was weather a black leather jacket. It was still light out when they opened with “Sunday Bloody Sunday,” but dark by the time “New Year’s Day” was finished. I could tell right away Bono was really hyped up. Their performance of “Bad” was the most impassioned I’ve seen so far this tour. Bono again sprayed water into the crow during “Pride” just as he did in Philly (and like he used to do during “Out of Control”). Someone had a HUGE sign asking Larry for drum sticks. After “Pride,” he gave one person a stick and another person a few feet away a stick. This DC show is tied with Chicago2 for my favorite of the seven shows I’ve seen so far on this 30th Anniversary Joshua Tree tour. It had an amazing fun, intense yet relaxed energy if that makes sense. It was just a joyous night. Chicago2 also had an amazing energy both from the band and the audience and was the first (and only time so far) I have heard “A Sort of Homecoming” and Larry blew a kiss during his “Elevation” cam. Please click here for all of my photos from U2 The Joshua Tree 2017 in DC. I am very thankful to have a week off to rest before my next show in Jersey because those are going to be an intense, exhausting five days! I drive up to Jersey Wednesday morning June 28th the day of the first Jersey show, go to the show that night, then the next night attend the second Jersey show June 29th, the next morning drive eight hour to Cleveland on Friday June 30th, go to the NKOTB (GA/Pit) show at the arena in Cleveland that night then the next night attend my 100th U2 show Saturday July 1st at the stadium, and the next morning drive home six hours on Sunday. Loving this band is exhausting, but so worth it because I Still Haven’t Found What I’m Looking For but I am enjoying the journey. FedEx Field logistically is dreadful. I’m trying to figure out why they dropped A Sort of a Homecoming from their set. It’s baffling and the setlist seems to me to be at least 2 songs short overall. I went to the Arlington, TX show and literally was in tears when Larry banged the drums on SBS to start the show. The Joshua Tree invokes some deep emotions in me and makes me flashback to RFK in 1987 and to my first time seeing U2. Keep on sharing your experiences with us. I love keeping up with your U2 journey. Aw thank you so much for reading! I’m glad you enjoy it. (I behind on my reviews of Philly and Louisville but they’ll be finished tomorrow) I would really like a sort of homecoming to return. I think it will jersey2. And yes this tour is very special for me as I missed it the first time because I was just 14 and my mom wouldn’t let me go. Of course I remember you! Hi! Hope you’re well. Thanks for reading. I don’t line up in the GA at all. I have been going in around 5:45pm and get front rail far right if you’ve seen from my pics. You can get in line at 3pm and be one person back from the Tree stage rail. Going in at 5:45pm I could get within 4-5 people from Tree stage rail but I don’t like to be in the middle of the crowd. Hello, this is a great website as I am also a huge U2 fan! Looking forward to NJ 1&2! Had a great time at Philly and D.C. FedEx field is a nightmare though! thank you so much! hope to see you in Jersey!